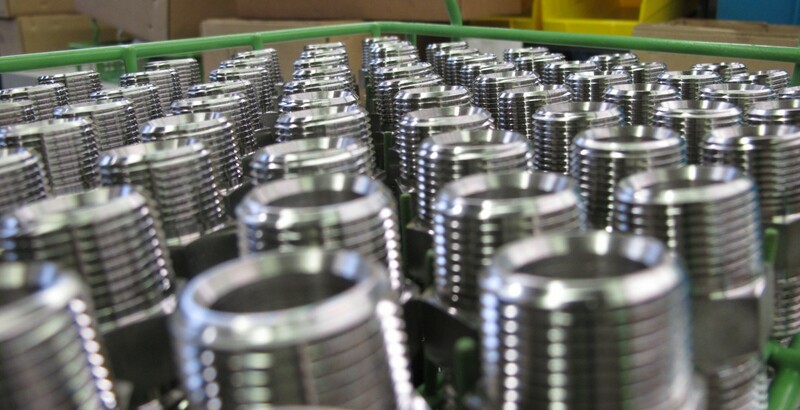 OmegaOne manufactures stainless steel hydraulic fittings and adapters in a variety of thread types. There are two main categories of threads which encompass the offering from OmegaOne. The two types of threads are straight or parallel threads and taper threads that both perform and seal differently. This blog covers taper threads, straight threads are covered separately. Tapered threaded pipe is commonly used in systems that handle liquids, gasses, steam and hydraulic fluids. OmegaOne fittings and adapters are manufactured primarily for use in hydraulic systems. The most common fitting in the United States and Canada is the National Pipe Taper thread or NPT. The seal for an NPT thread is a mechanical seal. The seal is formed as the male and female threads are tightened together forming a dry seal. The thread angle on an NPT and NPTF thread is 60 70 that have flattened peaks and valleys which is referred to as a Sellers form. Threads per inch, pitch and the peaks and valleys are different from those found on BSPT. NPT threads are designed to work in conjunction with a lubricant or PTFE tape, commonly referred to as Teflon tape. The use of lubricant or PTFE tape will help prevent thread galling during application. For more information on thread galling see our Technical brief about thread galling. The National Pipe Taper Fuel (NPTF) standard is designed to provide a better seal than the NPT. The NPTF thread is commonly referred to as a dry seal thread which is designed to work optimally without the use of lubricants or PTFE tape. The differences in thread are with the major and minor diameters as well as the root and crest of the threads. NPTF and NPT threads call for a similar crest though the NPTF crests have a smaller range. NPTF threads are designed to crush the thread producing a mechanical seal. As the fittings is seated, the male thread cuts into the female threads forming the seal. For this reason NPFT fittings are not reusable. Though the same function does not happen with NPT fittings, it is not recommended that NPT fittings be reused. Overtightening is common, particularly when a fitting is reused, which can cause galling or increase the likelihood of leakage. Application is the main factor used to determine the use of NPTF or NPT. When the application is critical and a sealing compound may fail due hear or high pressure NPTF threads are typically recommended. A dry seal thread is likely to perform a better seal than the NPT. It is not recommended that NPT and NPTF threads be used interchangeably as this will compromise the seal of the threads creating the potential for leakage. NPT pipe is covered by the ANSI B1.20.1 standard and NPTF is covered by ANSIB1.20.3. OmegaOne manufactures to the NPTF standard, which can be found on our pipe fittings (P series) our flare fittings (TX series) and flareless bite-type (F series) parts which are stock inventory items. British Standard Pipe (BSP) or British Standard Pipe Thread (BSPT) both refer to the same thread type. BSPT is an internationally adopted taper thread that is very similar to NPT and NPTF. The main difference between BSP and NPT threads is the angle of the thread. BSPT follows the Whitworth standard which uses a symmetrical V-thread and that is 55 70. The thread is truncated at the top and bottom and is rounded equally at the crest and root of the threads. This is difference from NPT threads which are flattened at the crest and root. Threads per inch are different for BSPT and NPT. Neither BSPT nor NPT/F are a better thread than the other. The BSPT threads are more common in Europe and Asia while NPT threads are more common in the United States and Canada. BSPT threads are becoming increasingly common in the US due to the prevalence of equipment manufactured from Europe now in the US. BSPT and BSPP threads are governed by ISO 228: joining of external and internal parallel threads (G) and ISO 7 or EN 10226: for external taper(R), internal parallel (Rp) and internal taper (Rc). OmegaOne does not stock BSP/BSPT as standard. We do produce specials and have limited stock of parts with BSP/BSPT threads. Contact us for availability or to quote your special.